A devotion to the handmade brought this couple together. Published on Monday, July 9, 2018. This article appears in the June/July 2018 issue of American Craft Magazine. In their house south of San Francisco, Kelly and Kevin Koski, with Cora, 4, and Ella, 2, live amid treasures they’ve care fully collected. 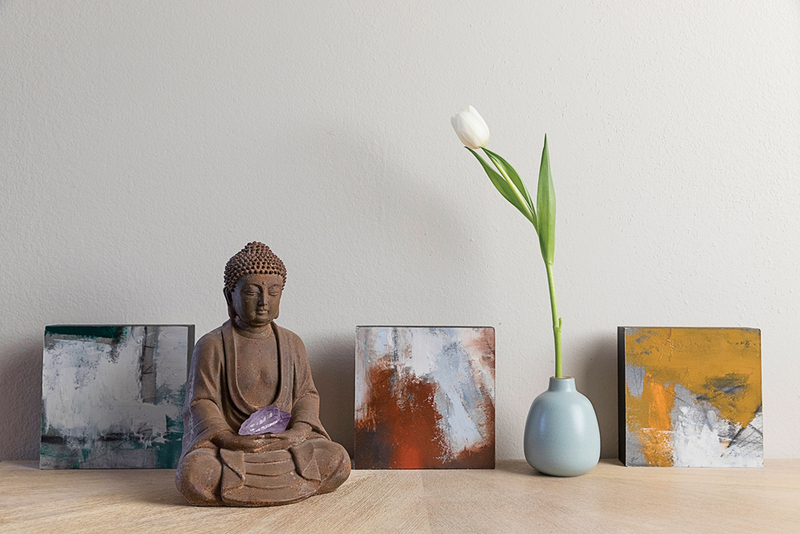 On the wall is an abstracted photograph by John Duckworth. Next to Kevin is a ceramic vessel by Bruno Kark. On the table is a raku pot by John Dodero. The first time Kevin Koski clapped eyes on his wife, Kelly, he knew she was the one, although it took six more years for them to become a couple. Recently graduated from the College of Charleston with a degree in arts management, Kelly Linton came to Charlotte, North Carolina, for an internship with a repertory theater; she was living at the home of Kevin’s mother, Barbara Laughlin, who served on its board. Despite his hesitation at being set up by his mom, Kevin flew in from New Jersey to meet the girl who was staying in his bedroom. The weekend ended with what Kevin describes as a “high-quality hug,” and that was it, for a while. That they kept in touch over the intervening years is a testament to the tenacity of Laughlin – a serious collector, longtime supporter of the arts, and former ACC trustee – and the mysterious power of craft. “Although we lived in different places, his mom kept inviting us to Charlotte at least once a year for various arts events, like the annual gala at the Mint Museum of Craft + Design or the McColl Center for Art & Innovation. She knew Kevin and I shared a deep appreciation for the handmade, and she truly believed we belonged together,” says Kelly, who is 39. In 2007, when Kelly was working at the Baltimore Museum of Art, Kevin surprised her in the sculpture garden with a 10-page love letter. The two were soon engaged, and after Kevin received a job offer in Silicon Valley (he holds a bachelor’s degree in electrical engineering and a master’s in technical management), they moved to California in 2008. Kelly took a job leading the marketing department at the Oakland Museum of California while she finished her master’s in museum studies. She left the museum at the end of last year to do consulting work and teach. 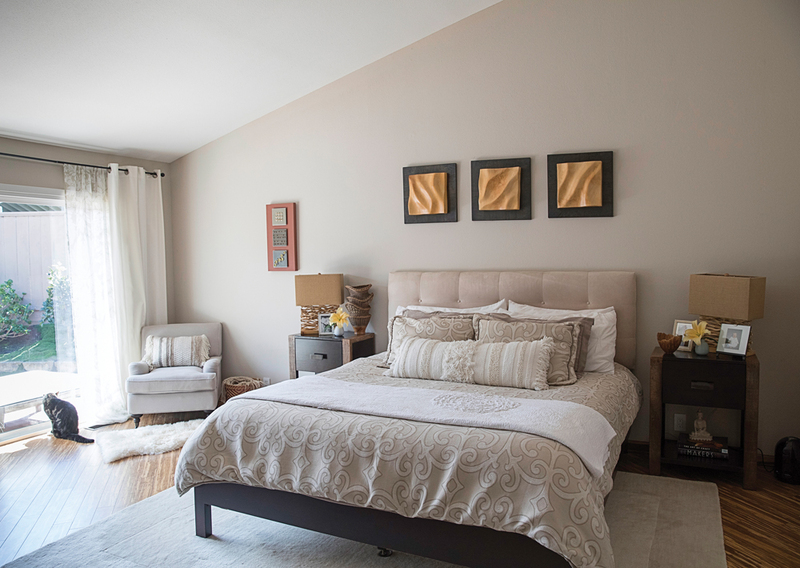 The triptych in the master bedroom is by Jay McDougall, who uses wood from downed trees. The couple met him at the Sausalito Arts Festival. “Most of the people we collect have also become our friends,” Kelly says. Kevin’s mother, an arts patron, gave them this exuberant basket as an anniversary gift. 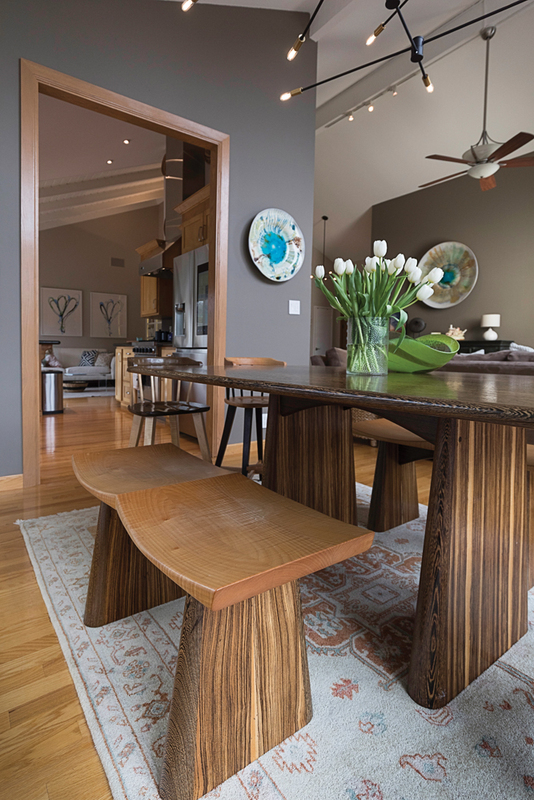 The table by Roger Combs was their first purchase as a couple – and a financial stretch at the time. They acquired the rest of the set little by little. In the distance is a triptych of flower paintings, in house paint on foam core, that Kelly bought for $5 each at a warehouse party. “They are among my very favorite things,” she says. These oil paintings on wood were a gift from the artist (and Kelly’s sister), Jamee Linton-Kelly. 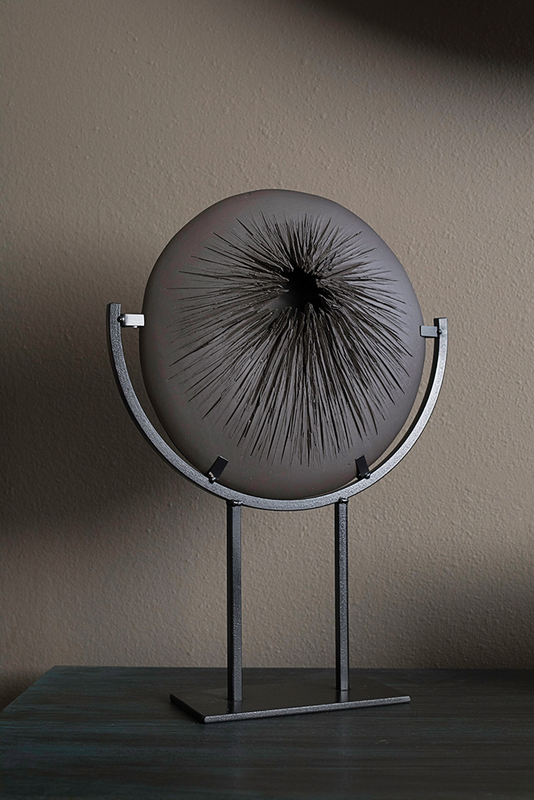 The Koskis bought this ceramic piece by Kris Marubayashi at an ACC show in San Francisco. They outbid stiff competition for this Mary Bayard White piece at another benefit auction. 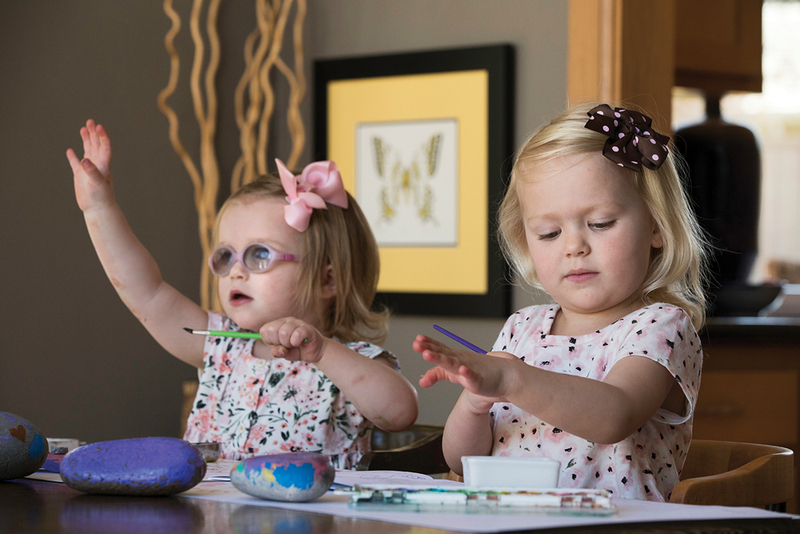 Ella and Cora like to paint rocks (and sometimes an arm or two). Their parents grew up around art and want the same for their daughters. 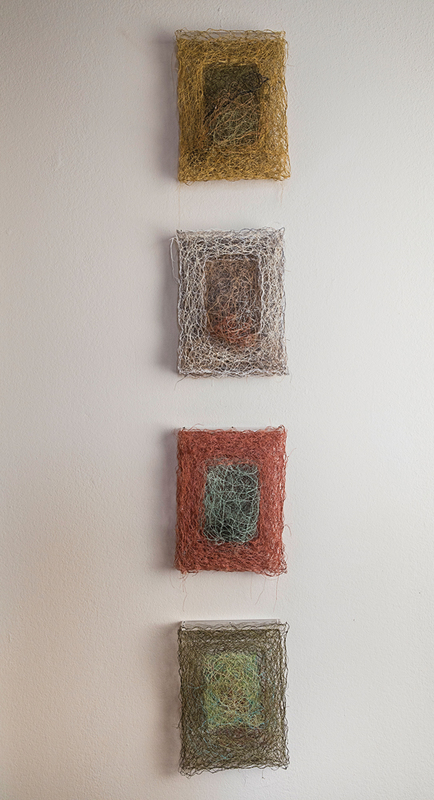 The couple bought this fiber work by Juline Beier at the Sausalito Art Festival, one of their usual stops. 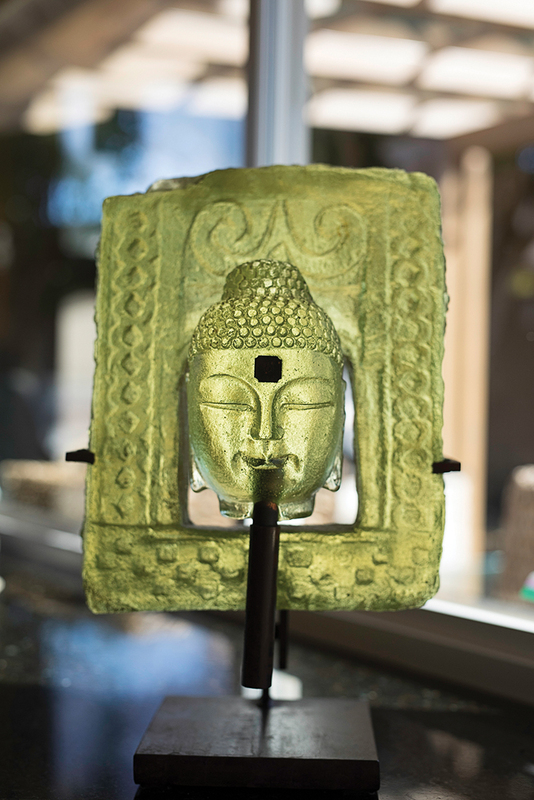 The Koskis paid for one of Marlene Rose’s Buddhas, their first glass piece, over time. Rose was happy to accommodate the young collectors. 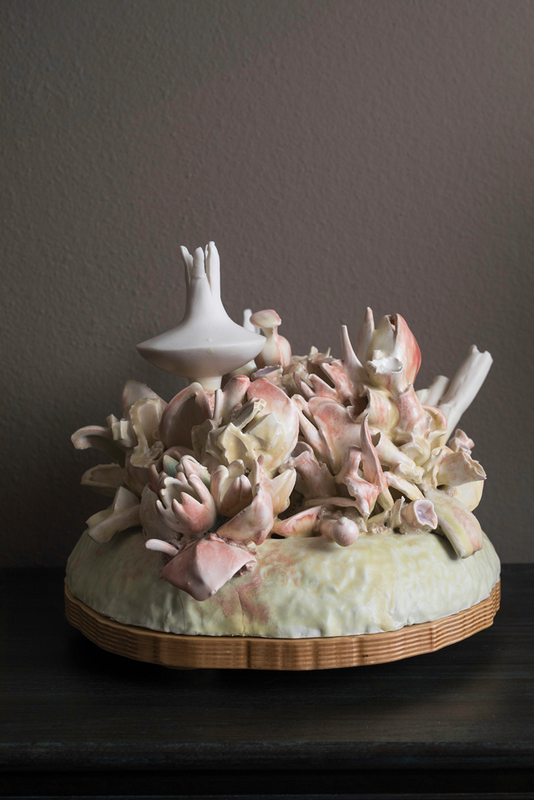 The couple bought this piece by ceramist Susan Beiner at a craft school benefit auction. We spent time with Kevin, 43, Kelly, and their young daughters, Cora, 4, and Ella, 2, in their home in Half Moon Bay, a coastal town about an hour south of San Francisco. Filled with treasures found at craft and maker fairs, art shows, and consignment shops, as well as those bestowed by Laughlin – who committed to giving the couple a new object for their first five anniversaries – it is like a time capsule of their courtship and marriage. When did you begin acquiring your collection, and do you consider yourselves collectors? Kevin: Definitely. Both of us were brought up in houses steeped in art, and craft was something we always appreciated together, even during the years we were not officially “together.” When we finally started dating, long before we had a house or the means, we’d spend weekends at fairs like SOFA [Sculpture Objects Functional Art and Design] in Chicago and New York, Art Basel Miami, and the ACC shows, just looking. Kelly: Art and craft are a major part of how we live our lives. We value creativity and the handmade, and that informs what we bring into our home, down to the mugs we use to drink our coffee. By seeing, using, and enjoying these things, we’re in a constant state of gratitude for the beauty and function they bring to our lives. What was your first major acquisition as a couple? Kevin: Right after moving to the Bay Area, I went to an ACC show in San Francisco and fell in love with an Asian-influenced wooden dining table by Roger Combs with these zebrawood endcaps. We bought it, even though it was beyond our budget, and we couldn’t afford the stools. Kelly: So we basically had one piece of furniture and a cushion on the floor. As our cash flow improved, we slowly added the benches and end tables, and more recently the toddler chairs, which Roger told us were the most complicated of all to make. Kelly, your career has been spent immersed in museums. Did any artists catch your attention while you were working in Oakland? Kelly: I got to know Mary [Bayard] White during an exhibition celebrating the 50th anniversary of studio craft. At the time, Kevin and I were becoming familiar with the Crucible [a nonprofit center in Oakland that offers classes in blacksmithing, glassblowing, and woodworking, among other mediums]. 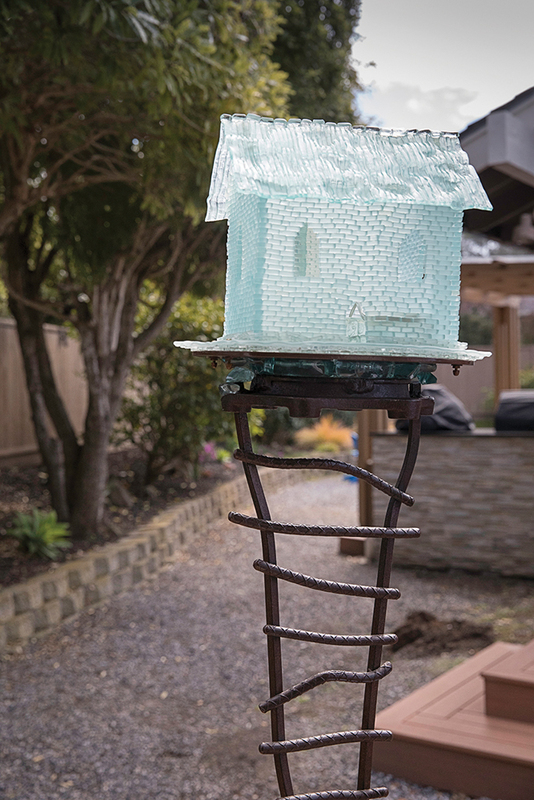 We attended their benefit auction because Mary had donated a glass and metal piece we loved from her Dwellings series, which focused on access to water and housing in the Bay Area. Kevin: And there was another bidder just as determined, so it did not end up being a bargain. But it was worth it. Are you particular fans of glass? Kevin: I’ve been drawn to glass since touring some of the private collections in North Carolina and seeing these massive, rich pieces by Stanislav Libenský. We can’t afford his work yet, but it’s on our bucket list. Kelly: The first piece of glass we bought together was by Marlene Rose, whom we met in Sausalito. We fell in love with this green Vaseline-glass Buddha, but we were just starting out and didn’t have the budget for her work. She said, “No one this young is collecting my work; we’ll figure it out.” And she let us pay it off over time. That issue is pertinent to all the arts, from opera to ballet to fine arts: the aging nature of audiences and collectors, and who will be the supporters of the future. Kelly: It’s true. And I think events like West Coast Craft are great feeder markets for shows by the ACC and others. The work tends to be smaller, so it can fit into an apartment, while cultivating an appreciation for the handmade. It’s so important to foster a connection to the work and the artists. In our case, we feel as if most of the people we collect have also become our friends. So you collect with your hearts. That’s very different from, say, buying an investment piece in the hopes it will appreciate. The two of you seem to fall in love with the same objects. Do you ever disagree? Kelly: So this is our philosophy: When we see something, we both have to be captured by it immediately. Every piece we’ve bought, we knew in an instant, and we couldn’t walk away from it. Kevin: That’s the beauty of art shows. If one of us doesn’t respond to something and doesn’t want to be pestered, we can just keep moving to the next booth. You also seem to share a pretty catholic approach to what you like, in terms of materials, genres, and styles. Kelly: That’s what was so wonderful about Barbara’s gifts; she wanted to represent all of the mediums. 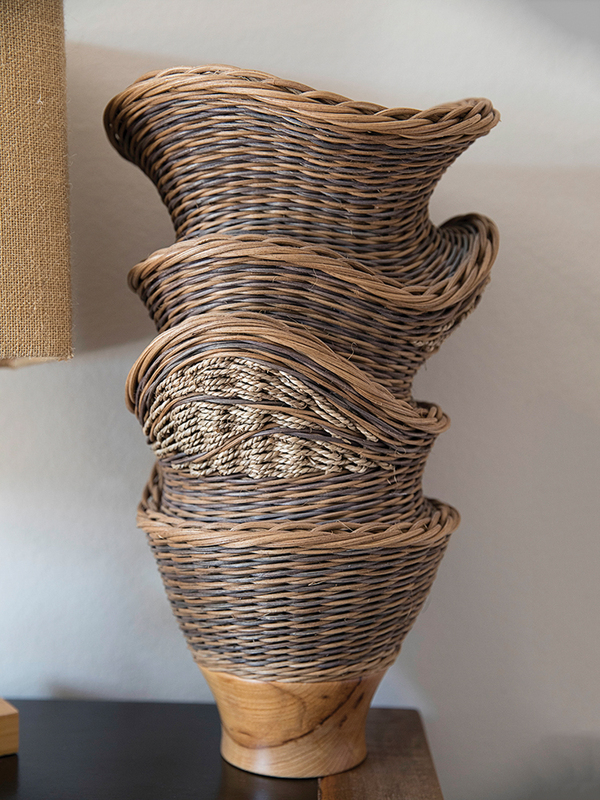 Our first year she gave us the raku-fired volcano bowl, made by John Dodero, and more recently a set of two pieces by Natalie Bork from her Battuto series, a kind of undulating mixed-media piece on aluminum, and there’s a beautiful basket made of fiber, reeds, and wood. And we also collect traditional baskets. My grandparents had a summer house on Lake Erie, and their neighbors brought masks and baskets back from Africa; some of the baskets – from Zambia, Uganda, Swaziland, Zimbabwe – have passed to me. And my mom has found us baskets by Native American makers in the Southwest. I like the mix of pieces, from established artists to finds in thrift stores, such as the large ceramic pieces mounted on the wall that reminded you of Peter Voulkos. Anything else that kind of grabbed you by surprise? Kelly: I went to a warehouse party at an artist’s collective in Baltimore, and this street artist named Terrek was painting the three pieces [now hanging] over the couch, using latex house paint on foam core. I bought them for $5 each, and they are among my very favorite things. My best advice about collecting: Just stay open, because the value has nothing to do with provenance or price. You just have to love it.